One of the most famous legends of St Francis is that of the wolf of Gubbio. In the town of Gubbio there was a wolf that was wreaking great destruction by killing and eating the livestock of the village. The villagers responded by waging war on the feared wolf. Whenever the villagers would set out to kill the wolf, the wolf would respond by attacking them. The crisis became so great that the villagers feared leaving their town and locked their children and themselves inside the town’s gate. St Francis heard of this problem and came to help the villagers of Gubbio. He went out unarmed to speak with the feared wolf. When St. Francis encountered the wolf he called him Brother and assured the wolf that he came in peace. 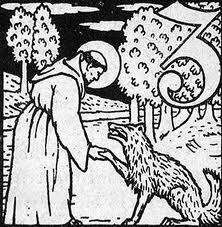 St Francis explained to the wolf the problems his attacks were causing in the village. St Francis then got the wolf to make a pact with the villagers. The villagers agreed to feed the wolf and the wolf in return agreed not only to cease killing their livestock, but also to become the protector of the village. In this way the village and the wolf came to live in peace. In this legend it is the gentle and humble heart of saint Francis that brings peace into a time of crisis and destruction. Instead of responding with fear or anger, St Francis shows compassion and love to all. In this way Francis is able to bring rest to a village that had been struggling with a difficult yoke. Unlike Francis, gentleness is rarely our first response with enemies and those who threaten us. But our anger seldom does anything to lighten our burdens. When we can humble ourselves enough to find compassion for the hurts of our enemies, we will sometimes find ourselves on the road to peace. How could we bring ease and rest at school and home by responding with gentleness instead of anger? Are there any wolves in our lives (bullies, enemies)? How might we be instruments of peace to them? Is there someone you’ve been struggling with that you could offer a special snack or treat in hopes of taming the beast? Lord make me an instrument of your peace. Dena Douglas Hobbs attends Saint Francis Episcopal church with her husband and two children. You can visit her blog, Centering Down. Tags: family, St Francis. Bookmark the permalink. My post for practicing families this week.